If you know me, there’s hardly a slow cooker recipe that I haven’t tried. 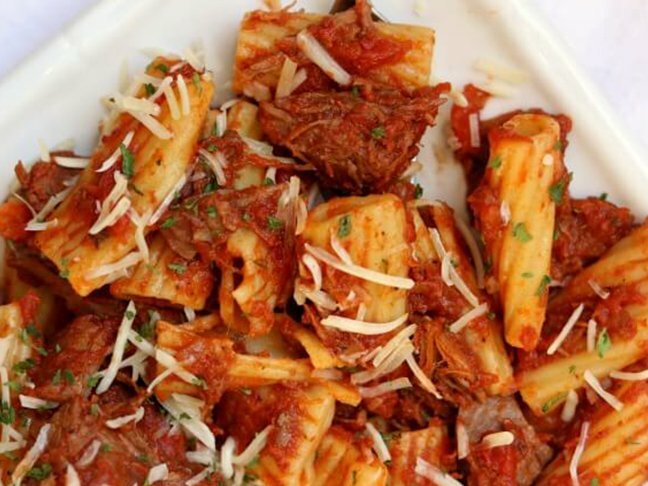 But slow cooker beef ragu was one of them. I’d seen pictures of it but never actually tasted it or made it myself—maybe because I thought it sounded too fancy or complicated. Turns out, it is ridiculously easy to make, and now I’m kicking myself for waiting so long to try it. You start with a budget-friendly cut of beef—chuck roast is your best bet. I like to cut it into two-inch pieces. This ensures that each piece will get coated with seasonings and sauce. My favorite way to cut beef is to have it partially frozen. The knife just slices through it so much easier when it’s frozen than when it’s completely thawed. Sometimes I’ll even throw my meat in the freezer for 10 minutes before cutting it. Once you’ve prepped your beef, throw it into a slow cooker along with a few seasonings and some crushed tomatoes. 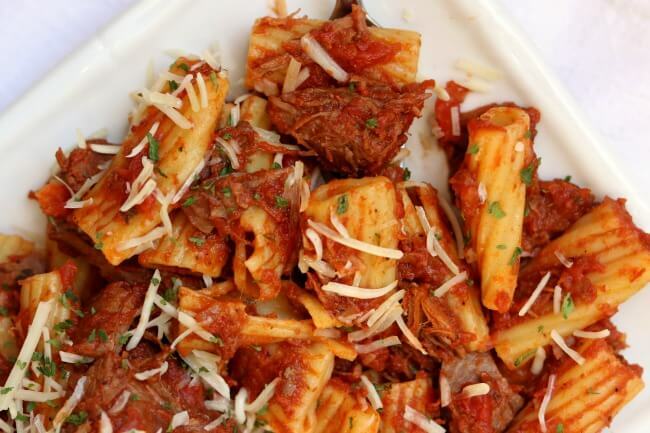 Walk away for eight hours, and when you come back to it, the beef will be easy to shred and serve over some al dente pasta, like rigatoni or pappardelle. The dish tastes amazing and requires very little effort—my type of meal! 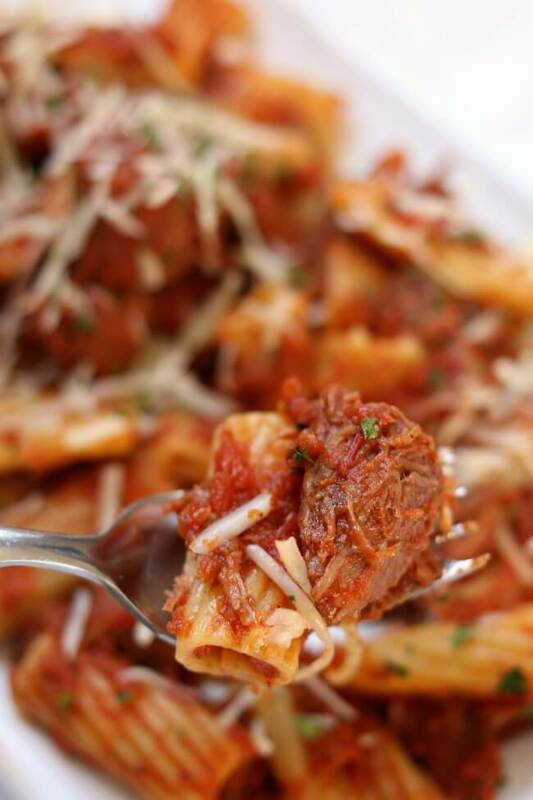 Want to try your hand at your own slow cooker beef ragu? Follow my easy recipe below. Step 1: Turn on your stove to medium-high heat. Heat a pan on the stove for a few minutes. Add olive oil. Add the onion. Sauté for about 3 to 4 minutes. Stir the sautéed onions into the slow cooker. Step 2: Stir in the oregano, rosemary, tomato paste, salt, pepper, crushed tomatoes, soy sauce, and bay leaf. Step 3: Nestle the meat into the slow cooker. Step 4: Cover and cook on low for 8 to 10 hours, or until beef is very tender and shreddable. Step 5: Break the beef into about one-inch pieces with tongs. Stir in the vinegar. Step 6: Follow the directions on the package to prepare the pasta. Reserve half a cup of the cooking liquid. Add the pasta to the slow cooker along with the pasta water. Toss. Season with salt and pepper to taste. 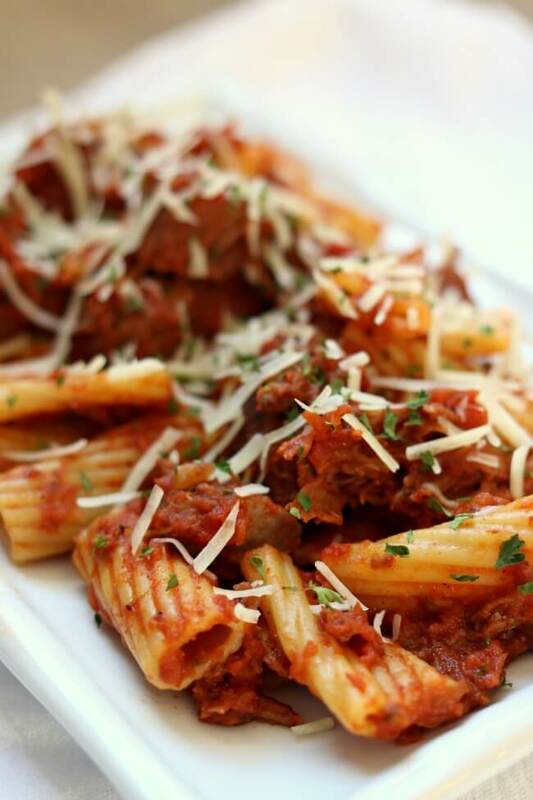 Serve the pasta and meat with Parmesan cheese.